Are you looking to get your feet wet on a true adventure? Expedition cruising is the next big thing! Captain's Choice have a great range of intrepid adventures across unchartered waters set to open your mind to new horizons. From luxury expeditions to exotic islands to knuckle whitening polar quests, Captain's Choice have an adventure planned for all interests. Expedition cruising isn't only about the remote and exotic destinations Captain's Choice are known for, but also for the inspirational Expedition Team that takes you there. You'll be prepped with talks from Antarctic explorers, historians, geologists and biologists who know where to find the best photography spots and wildlife in the area. You'll leave as experts in the area. Smaller ships are able to access out of the way ports that larger ships cannot reach and trusty Zodiacs nudge closer to the action, offering front row tickets to wildlife and natural wonders straight out of National Geographic.Expect enriching activities like hikes, kayaking and bird watching to colour your adventure as you prepare to take a walk on the wild side. Of course luxury expedition cruises come with the dash of luxury you've come to expect from Captain's Choice. No doubt the novelty will never wear off on a Silversea expedition cruise as you step off your Zodiac and a butler is waiting for you with a steaming hot chocolate. It's the best of both worlds. 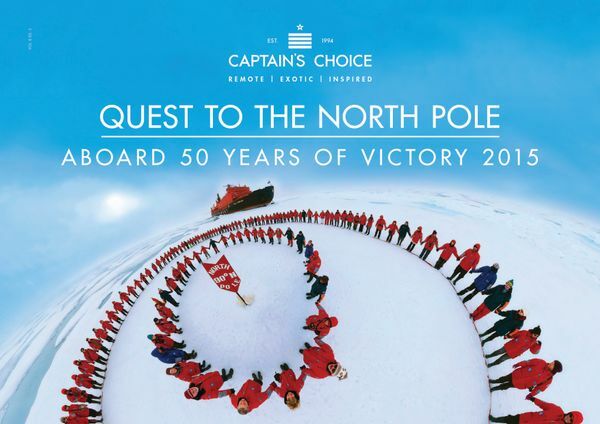 Captain's Choice are going further than ever before aboard 50 Years of Victory, the world's largest nuclear powered ice breaker in July's 2015's Quest for the North Pole in July 2015. This may not be a luxury expedition cruise, but it's sure to set even the hardiest adventurer's pulse racing! Why not ring in 2016 in a very special way with a unique Fly-Cruise Antarctic Expedition starting in Punta Arenas, Chile on New Year's Eve 2015, enjoying the bracing beauty of the South Shetland Islands aboard the MV Sea Explorer, before an adventure of outback Patagonia? There are worse ways to say Happy New Year!